Ear infections are a common affliction for children, but that doesn’t mean that they’re normal or should be “waited out”. Parents tend to feel helpless when young children have an ear infection because it seems like there’s little they can do. In fact, ear infections are one of the most common reasons for a visit to the pediatrician. In some cases where bacteria is responsible for the infection, this can be a smart choice. However, infections are often viral and do not respond to antibiotics. If the ear infections are being caused by improper drainage, tubes may be surgically implanted in the ears to aid in this process. This is obviously very expensive and may be traumatic for the child—and the tubes may come out. A comprehensive chiropractic examination can uncover many of the problems related to the nervous system which can result in ear infections. Chiropractors understand that ear infections are caused by fluid accumulating in the ear due to muscle tension or misalignment. By removing the fluid, the bacteria have no place to live and eventually die. The human body has a remarkable ability: it can fight off infections. However, if that ability becomes constrained in any way, it increases the likelihood that problems like ear infections will occur. If the nervous system is impaired, the immune system is impaired. 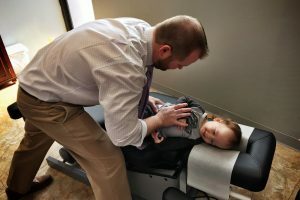 Chiropractic treatment can help in many cases. Some parents are surprised to discover that the nervous system is primarily responsible for regulating the ear. In the event that the upper neck or spinal area are damaged, the ear may also be affected since the nervous signals coming from the brain and going out to the rest of the body, including the ear, will be impaired. This may cause the ear to “protect itself” from an infection. The nervous system can become impaired if the nerves and muscles in the spinal area become damaged or otherwise unable to do their jobs. These muscles protect the spine, but when they’re malfunctioning and experiencing spasms, the pressure caused by this can affect the nervous system and thus the ear. We have a natural approach to most medical situations. 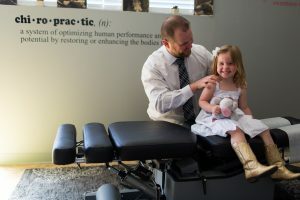 While chiropractic adjustments are absolutely not intended to treat or cure any kind of infection, many parents have chosen to provide their children with chiropractic treatments and examinations. During these examinations, we’ll seek out upper spine problems. If they’re found, they’ll be gently reduced and hopefully corrected entirely. This will restore the proper functioning of the nervous system and may result in a dramatic reduction in ear infections. We would love to have the opportunity to talk about this with you more, give our office a call for a no-obligation consultation.